On and following Election Day (November 6th) 2012 there were many reports about long lines and confusion at polling sites across the nation. Media reports cited some similar concerns locally. As such, we have designed a brief survey (just 10 questions) for you to tell us about your experience on the most recent Election Day. The survey is for you to inform us about favorable and problematic experiences on Election Day. 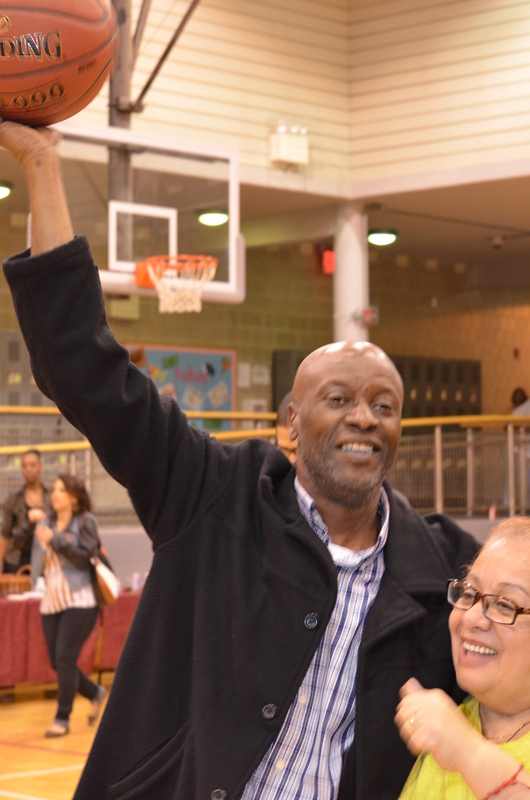 If you have questions about the survey, please do not hesitate to call Joe Pressley at 212-828-9800. You can also email him at jpressley@council.nyc.gov. The survey will only take about 5 to 10 minutes to complete! On Friday, November 2nd at around 12:00 noon, we will be meeting up with Council Member Margaret Chin (District 1), where Hurricane Sandy hit the hardest in Manhattan, at the Chinatown Partnership Local Development Corporation (CPLDC) on 60 St. James Place. From there, volunteers will be assigned to different tasks to assist downtown. While transit is still a challenge downtown, the M15 Select Bus Service on 1st and 2nd Avenues (which will again be free tomorrow) is a great option to get to CPLDC. The Food Bank needs volunteers at their warehouse in the Bronx. People are needed tomorrow (Friday, November 2) to repack donated food for delivery to emergency food organizations. The volunteer shifts are 10:30 AM – 12:30 PM and 1:30 – 3:30 PM. For more information, contact the Food Bank’s Triada Stampas at 917-568-3389. 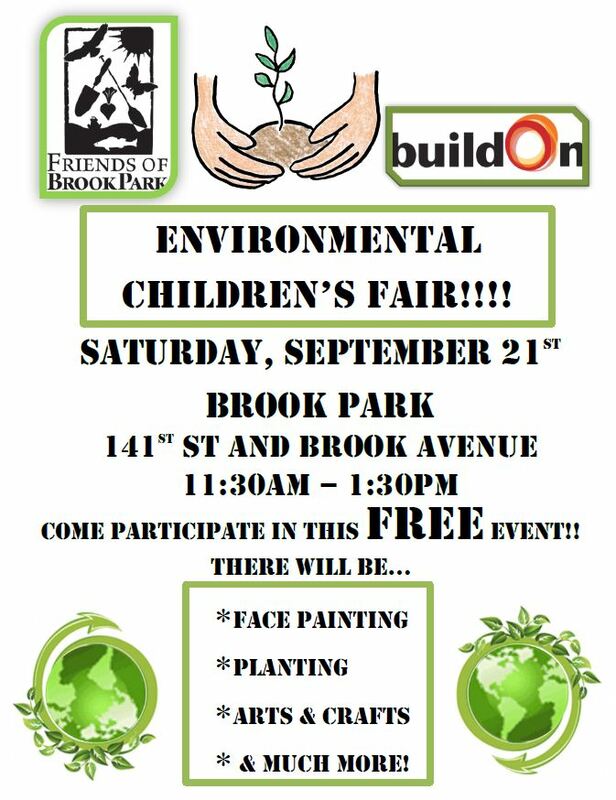 Address: 355 Food Center Drive, Bronx NY 10474. It is accessible by subway/bus combo: 6 to Hunts Pt, then the Bx6 bus to the Hunts Pt Market. Additionally, the Parks Department is accepting volunteers to help aid in clean-up and recovery of parks citywide. For those who would like to volunteer, please follow the provided link to submit a volunteer application. When showing up to help, please remember to dress appropriately – closed-toe shoes and clothes that can get dirty are appropriate. Bring a water bottle and snacks (water refills and restrooms will be available at each site). All supplies for the clean up effort will be provided. Children 12 and older are allowed to lend a hand. MANHATTAN – Click here to register to volunteer. 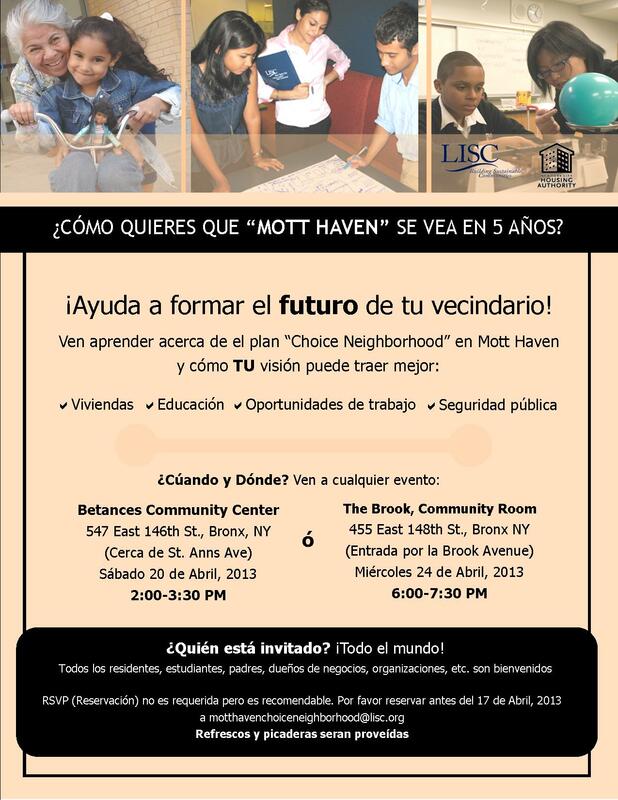 BRONX – Click here to register to volunteer. A hopeful sign that we are on our way to recovery: We are happy to report that the MTA will begin restoring select subway lines for tomorrow, November 1st (though there is still no train service below 34th Street). Click here for the full list of subway lines and the specific routes they will take. Or you can click here to view a map of available service tomorrow. If you are driving tomorrow or Friday, please keep in mind that all of the East River bridges, as well as the RFK/Triborough Bridge, Henry Hudson Bridge and the Lincoln Tunnel will be required to have 3 or more people in order to enter into Manhattan from 6:30 am to midnight. Just because you missed one of our Participatory Budgeting (PB) neighborhood assemblies doesn’t mean that you can’t brainstorm on ideas on how we should spend capital funding in our district. Please visit District 8′s PBNYC website, created by Project for Public Spaces, where you can submit your ideas, browse other submissions and share your comments. We will be accepting submissions until November 12, 2012 at 9 AM. Anything submitted after 9 AM will not be considered. 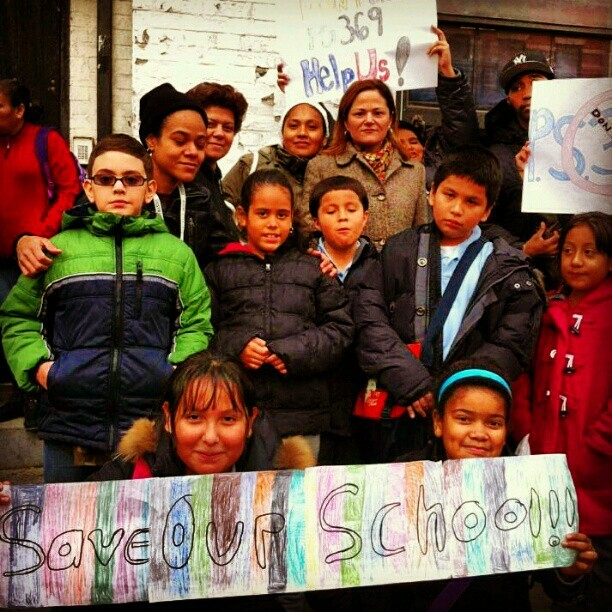 District 8 is one of only eight districts in New York City where PB is practiced. Typically, this funding is distributed at the exclusive discretion of Council Members, but this year 1.3 million residents of these eight districts will have an opportunity to brainstorm, shape and vote on capital projects in their district. This revolutionary process ensures that your voice is heard, so please share with us any proposals you have – and who knows, it may be one of the winners. Click here to find out more about the PB overview and process. Do You Agree with the Proposed New District 8 Lines? Good Evening. 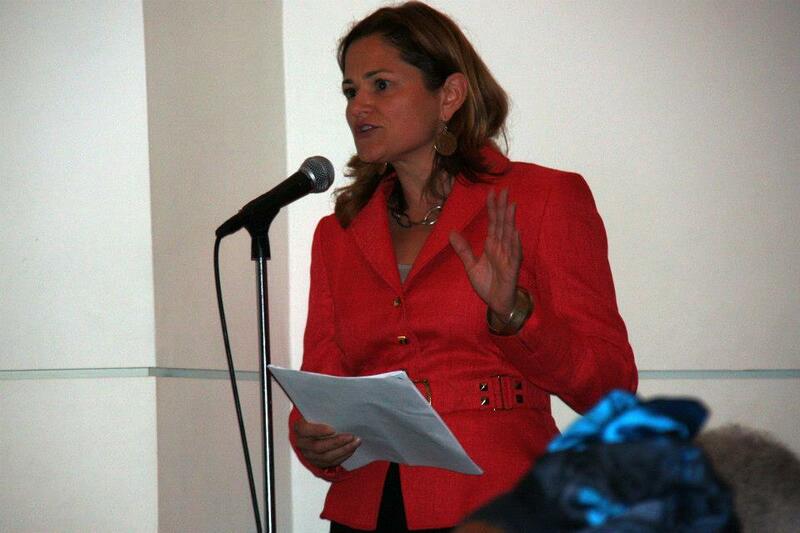 I am Council Member Melissa Mark-Viverito, and I represent Council District 8 on the City Council. This district currently includes El Barrio/East Harlem, Manhattan Valley, part of the Upper West Side and part of Mott Haven. I am here this evening to express the serious concerns I am hearing across my district about the Commission’s preliminary draft lines. In the weeks since this proposal was released, I have studied the draft lines closely and have had countless meetings and conversations with members of my community as well as leaders around the city. At this time, I am prepared to state emphatically that these proposed district lines as presented are completely unacceptable to the communities I represent. In looking at the proposed new district, and the rationale expressed by the Districting Commission, my constituents have expressed deep concerns for a number of reasons, and I share these concerns. First, the proposed lines divide up neighborhoods in a way that is unfair to those communities and does not reflect the realities on the ground. Second, the proposal moves pockets of the current District 8 that are solidly Latino into districts that do not necessarily share their cultural and neighborhood identity. Finally, the proposal to split the 8th District evenly between the Bronx and Manhattan, allegedly done in the spirit or “borough equity,” actually marginalizes residents of Manhattan. Click here for the remainder of the testimony. If you are concerned about the future lines of District 8, which you can view here, we urge you to make your voice heard and submit written testimony to the Districting Commission. Every voice matters. Currently there is only one certified GJ/GNY contractor in the entire Bronx! Becoming one can grow your business! Through the Green Jobs Green NY (GJGNY) program, thousands of homes can receive free or reduced cost audits and retrofits, stopping air leaks, installing installation, upgrading HVAC systems, changing lighting, etc. In order to do this work, a contractor must be Building Performance Institute (BPI) accredited before they can participate in the Home Performance with ENERGY STAR® program sponsored by the New York State Energy Research Development Authority (NYSERDA). What BPI certification encompasses, how to become involved in the NYSERDA GJGNY program, and available incentives. AEA, BCC, and Solar One will discuss their training opportunities for BPI certification. What contractors need to be prepared to offer, in terms of capacity to get the assessments and retrofits completed. MWBE certification and the opportunities for procurement that it can open up for MWBE contractors. Also additional incentives and training funding opportunities offered through SBS. Additional incentives for business development for GJGNY, such as OJT training funding. If you are interested in taking advantage of the quickly expanding market for home energy upgrades or “green jobs”, RSVP today! Construction & General Building Laborers’ Local 79 will be taking the first 2,000 applications they receive for the opportunity to become a Skilled Construction Craft Laborer Apprentice with the hopes to accept up to 200 Apprentices in the next 9 to 24 months. As a first-year Apprentice, you will be making $36.80 per hour in wages and benefits. Upon completion of the apprenticeship, you will become a Journey worker, making $59.39 per hour in wages and benefits. This is obviously a great opportunity, not only to be a part of a union, but to have a career. Everyone that applies will be mailed a letter of invitation for an interview. These names will be drawn at random, when needed periodically over the next 9-24 months. This could take up to 2 years depending on economic conditions. If you or anyone else you know is interested, make sure to apply as early as possible so that you’re part of the first 2,000 applicants. 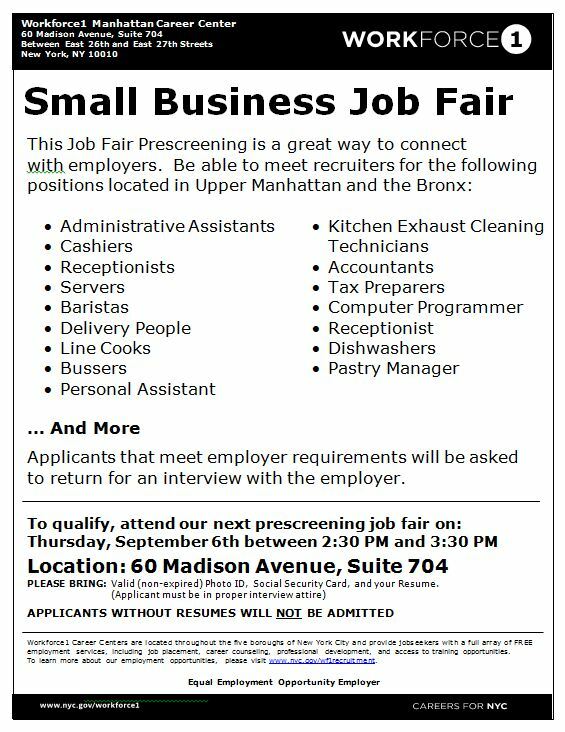 Tomorrow, the Workforce1 Manhattan Career Center is hosting a job fair prescreening event featuring small businesses in Upper Manhattan and the Bronx that are looking to recruit employees in a number of fields. Applicants that meet employer requirements will be asked to return for an interview with the employer. See below for more info! Please bring: Valid (non-expired) Photo ID, Social Security Card, and your Resume. It seems like only yesterday when we were finishing up our first year implementing the Participatory Budgeting (PB) process. We had a fantastic turn-out – hundreds of local residents came out to vote for project ideas that were developed by the community, from a Meals-on-Wheels van for seniors to playground renovations for youth. We are excited to announce that we are entering our second year of the PB process. Last year was such a success, some even say “revolutionary,” that four more Council Members have signed on to bring the program to their communities. Through the PB process, community members will directly decide how to spend at least 1 million dollars in capital funds in each of the eight participating districts. Typically, this funding is distributed at the exclusive discretion of Council Members but this year 1.3 million residents of these eight districts will have an opportunity to brainstorm, shape and vote on capital projects in their district. Have something you’re passionate about? Want to get involved? 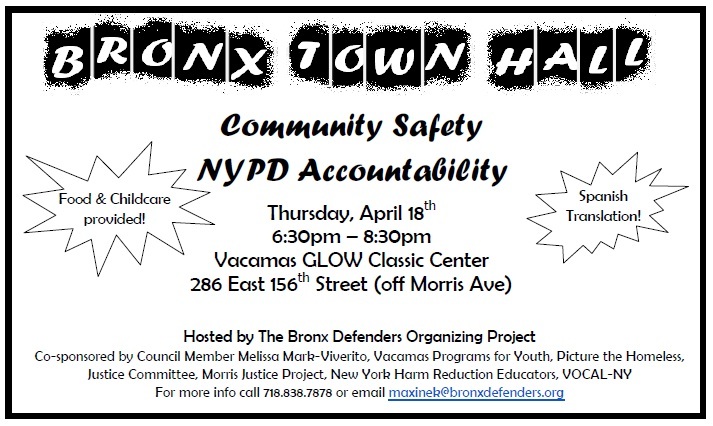 Our offices, along with PBNYC, will be hosting numerous neighborhood assemblies. Whether you simply want to learn more about the PB process or submit your ideas for projects that you’re passionate about and will make a difference in our community, the neighborhood assemblies are the venues to do so. Come join us at a Neighborhood Assembly. We even have a specialized one just for seniors and one just for youth (14 to 24 years old). Food & Spanish translation will be provided at all assemblies. Here is your chance to be heard and make a difference. See you there! If you are interested in taking part or have any questions or suggestions, email us at mmvbudget@gmail.com. 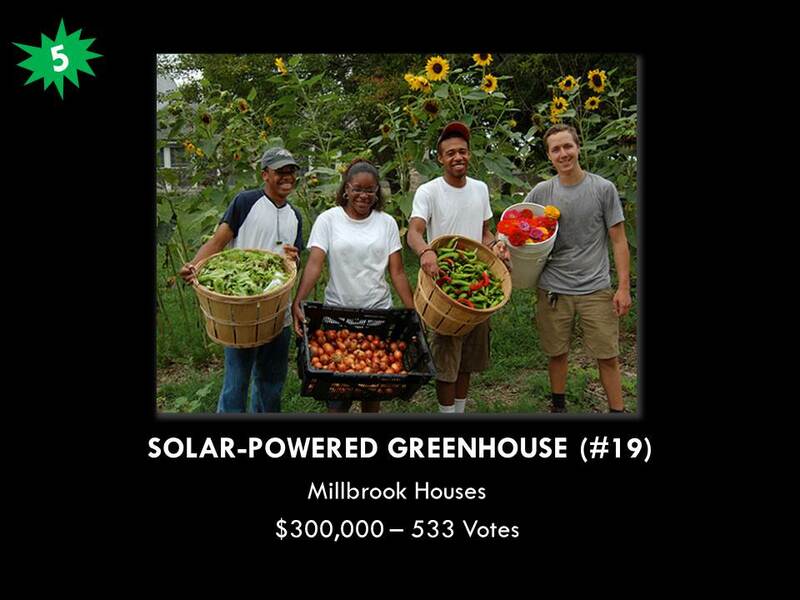 Click here for our PB Page that includes the outcomes from last year’s vote. 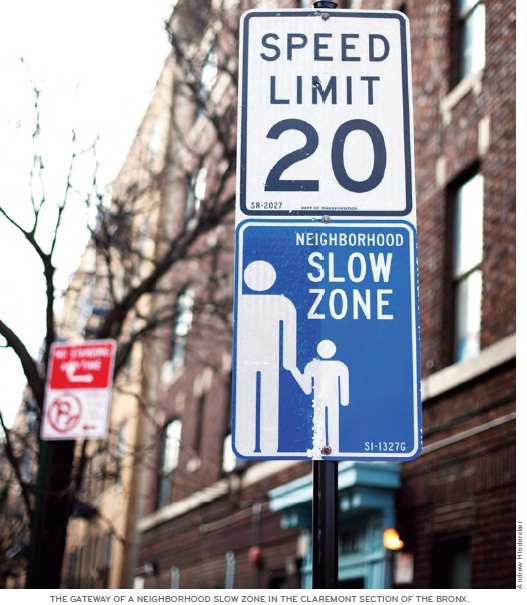 General information about the citywide PB process is available at www.pbnyc.org and you can find their rulebook here. 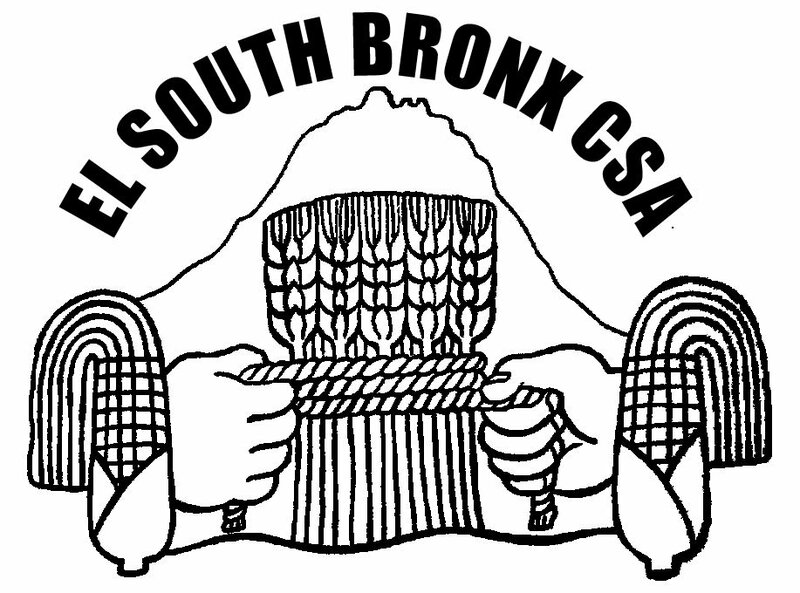 The lead community partner in this project is El Barrio/East Harlem-based Community Voices Heard and the lead technical assistance partner is the Participatory Budgeting Project. Achieving a higher education is very much a reality for DREAMers. 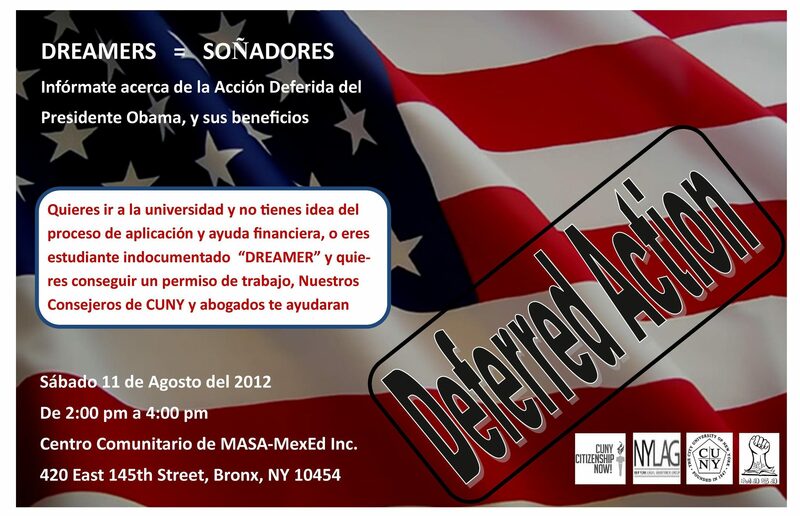 On Saturday, August 11th, MASA-MexEd, along with CUNY Citizenship Now, CUNY’s Admission Office and the New York Legal Assistance Group will be hosting an informational workshop covering everything from President Obama’s Deferred Action to how to apply to college regardless of your legal status. DREAMers, family and friends are welcome to come take advantage of this free session and receive guidance about obtaining a work permit, applying to college and learning what financial resources are available to you. 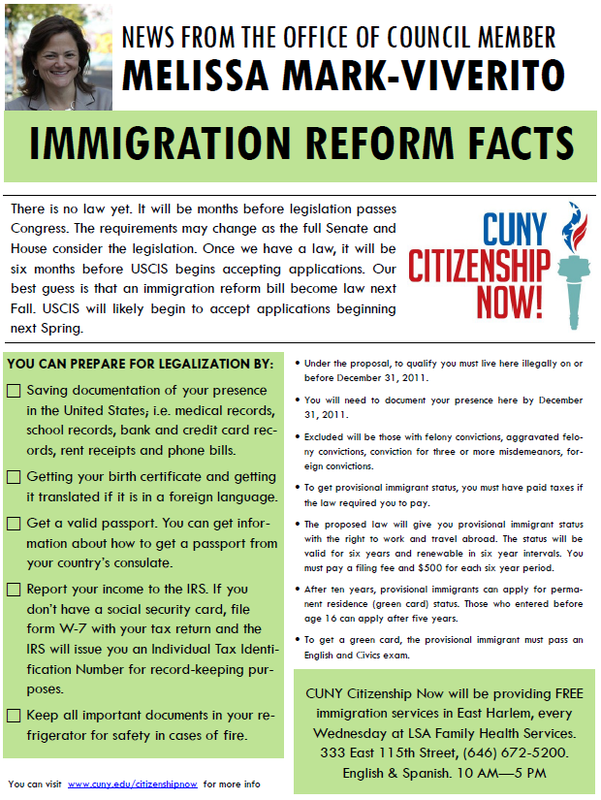 Your legal status does not mean that you cannot obtain a college degree. The first step is finding out the tools you need to succeed at the Deferred Action and College Fair Information Session on Saturday. 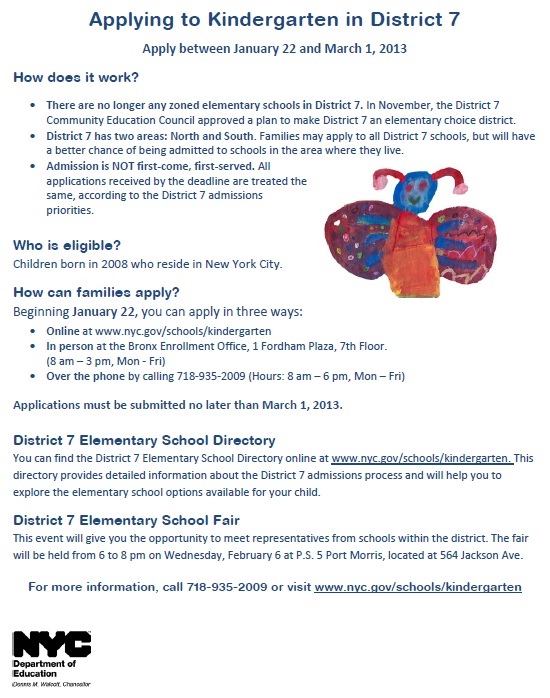 The application process for Fiscal Year 2013 discretionary funding is now available on the Budget section of our blog. Please visit www.mmviverito.com/budget for the latest info on deadlines, application forms and other requirements. 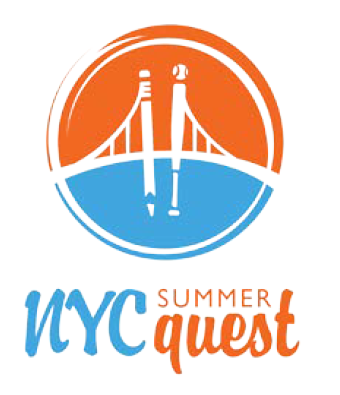 For more information please contact Joe at 212-788-6960 or jtaranto@council.nyc.gov. 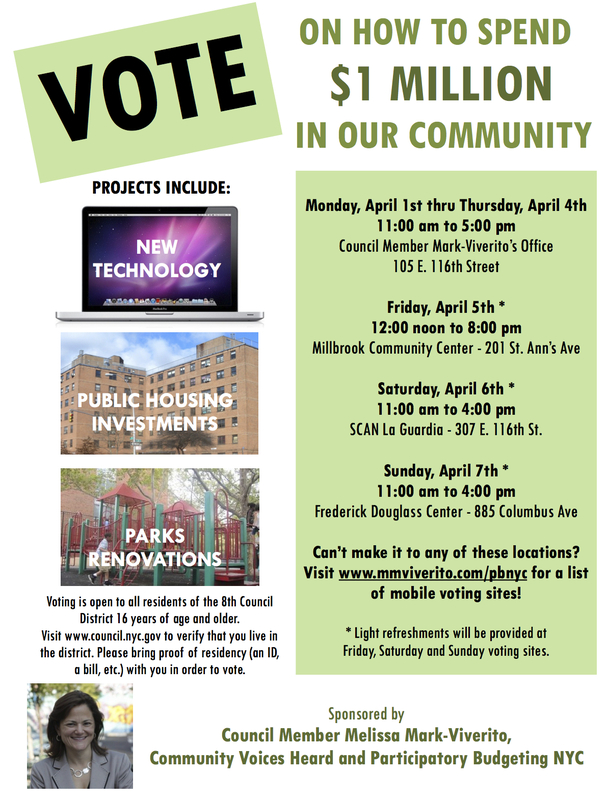 In less than two months, the participatory budgeting (PB) process will conclude with District 8 residents finally voting on how to spend at least $1 million on infrastructure projects to improve our community. For more information on the process thus far, links to all the project ideas that were submitted, and more visit our PB in District 8 page. 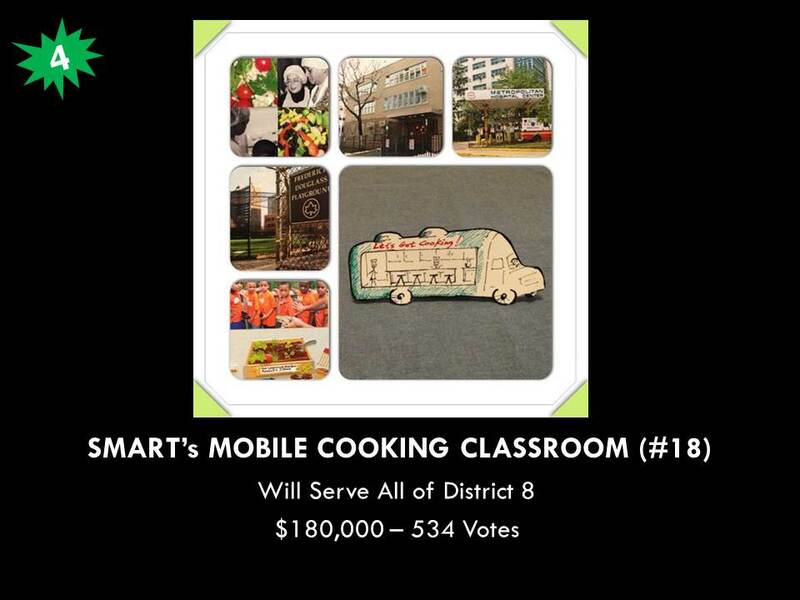 Sunday, March 25th and Saturday, March 31st will be the official voting days for PB, with other mobile voting locations to be announced. Times, locations and other details are coming soon. But before the vote, we must begin by taking the time to inform ourselves about the options that will be available to us on the ballots. Come and learn more at this month’s neighborhood assemblies. Please click here to RSVP! 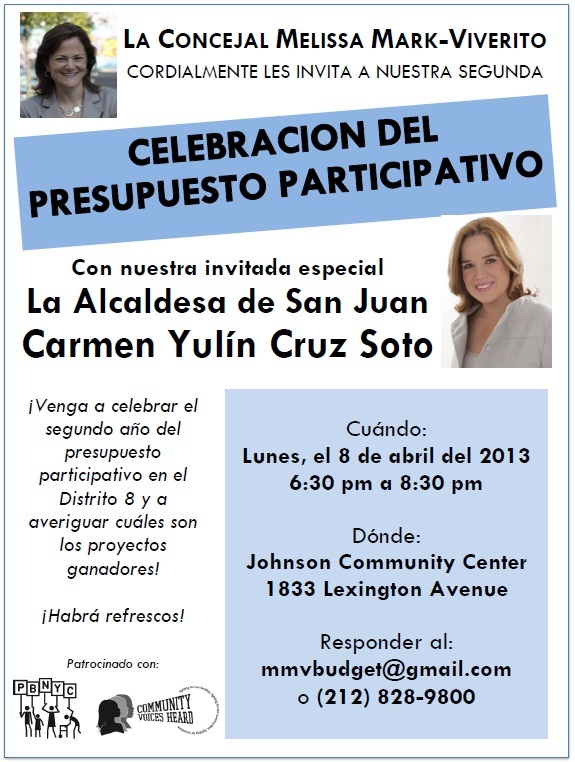 Translation in Spanish will be available and refreshments will be served. Community residents have been refining the ideas generated at the October-November public meetings into concrete proposals for the past three months. You’ll be amazed by what they’ve come up with. Make sure to join us! For more information contact Max Cantarero at mmvbudget@gmail.com or (212) 828-9800. You can also print out a flyer to show your neighbors. I hope your holidays were both restful and full of cheer. As I looked back at our community’s many accomplishments in 2011, I couldn’t help but reflect on how hard we worked and how much it paid off. 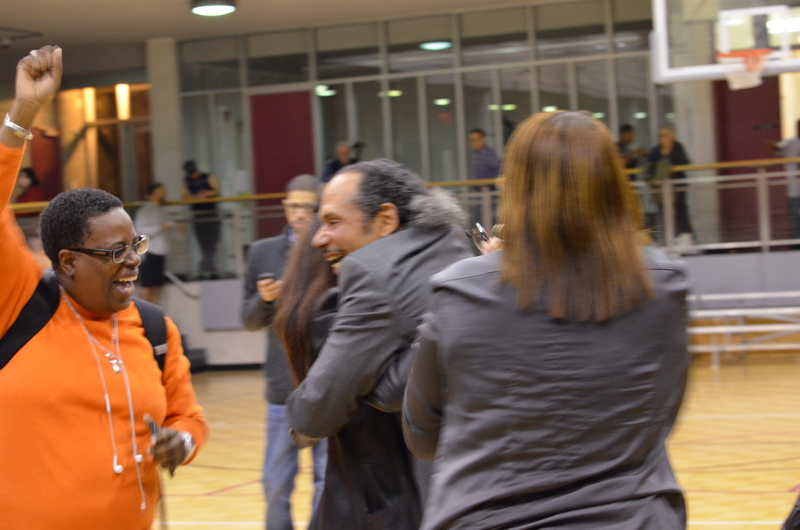 In the coming year, I look forward to continuing to expand even further on the progress we are making in District 8. What are your New Year’s Resolutions for our community? Please leave them in the comments section below! Last year, we engaged directly with local residents to help shape the future of our community. The El Barrio/East Harlem Youth Violence Task Force, which was convened by my office, released its official platform, a plan to bring peace to our streets that was created in conjunction with our community’s youth. Soon after the release of our platform, NYCHA finally opened the Johnson Center after over 10 years of community struggle. Our community was also one of four in the city to take a major step towards democracy in 2011 as my office began implementing a Participatory Budgeting (PB) process in Council District 8. Through PB, community residents will decide how to allocate $1 million in discretionary funds towards capital projects of their choosing. For our older residents, my office continued to make progress on developing El Barrio/East Harlem’s Age Improvement District, by working with the City to launch Senior Pool Hours at Jefferson Pool and to unveil several new benches on our sidewalks, which will provide a resting place for older adults as they walk outside. And let’s not forget the citywide and national efforts to which we have contributed. Like so many of you, I have became more motivated than ever to pursue economic and social justice in our community and our city. I marched alongside thousands of Occupy Wall Street protestors and was arrested for civil disobedience as a way of making a statement on the unconscionable level of economic inequality in our society. I was also proud to sponsor and see passed into law a bill that will help protect undocumented New York City residents from detention and deportation, which will help keep more families united. Our accomplishments in 2011 have set the bar for a great 2012. We’re starting off on the right foot by celebrating Chinese New Year with our Chinese neighbors this month (more details to come). From there, the work continues. 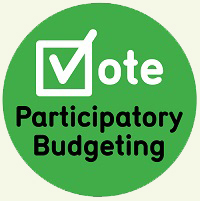 After another round of public meetings in February, we will hold the official Public Vote for the Participatory Budgeting process in late March. And of course my office and the organizations that make up the Youth Violence Task Force will continue to lead the fight for safer streets, as we seek funding to implement the recommendations from our platform. In the coming months, I will also be fighting against City budget cuts and to bring more resources to our neighborhoods. And as always, I will continue to be active on local issues of importance across our district. Exciting and challenging times are ahead. Please don’t forget to take a moment to share your New Year’s Resolutions for our community by leaving a comment below! 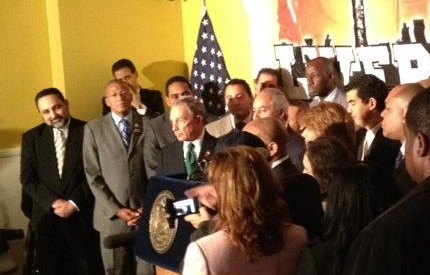 Melissa joined Mayor Bloomberg, elected officials and representatives from the livery taxi industry in Washington Heights yesterday to celebrate the agreement reached between Governor Cuomo, the State Legislature and advocates on a bill that will provide legal street hail service to under-served areas in New York City (including Upper Manhattan and the outer boroughs). The bill will also authorize a medallion sale that could bring up to $1 billion in new revenue to the city to help plug our budget deficit, and will expand the number of wheelchair accessible taxis. Earlier this year, Melissa stood against a plan that would have excluded a vast number of livery bases and drivers by offering upgraded street-hail licenses at prices that were far out of reach for our communities; however, she strongly supported the bill that was ultimately passed by the State Legislature in June, which made this business opportunity more affordable, while still expanding service to parts of our Council District. Young people generate project ideas at our Youth Assembly (Oct. 25, 2011). Following seven neighborhood assemblies held during the month of October as well as a period of submissions through our online platform, we are pleased to share with you the final list of participatory budgeting (PB) project ideas from Council District 8. This list will be made available to the dozens of budget delegates who have signed up to help formalize these project ideas into concrete proposals. All of the ideas, sorted by committee, are available at http://tinyurl.com/pbideas8. This list will be updated on a regular basis as we receive new updates from delegate committees. Over 550 individual ideas were submitted as part of this brainstorming process. As you will see, suggested projects range from new technology for schools to park renovations and security cameras for NYCHA developments, among many others. While some of the suggested projects are not eligible under PB because they do not require capital funding, our office will look into these ideas to see if there are other mechanisms available to bring them to life. Budget delegates will officially begin meeting next week and will start reviewing the project list. If you are still interested in becoming a budget delegate, there may still be time to get up to speed. 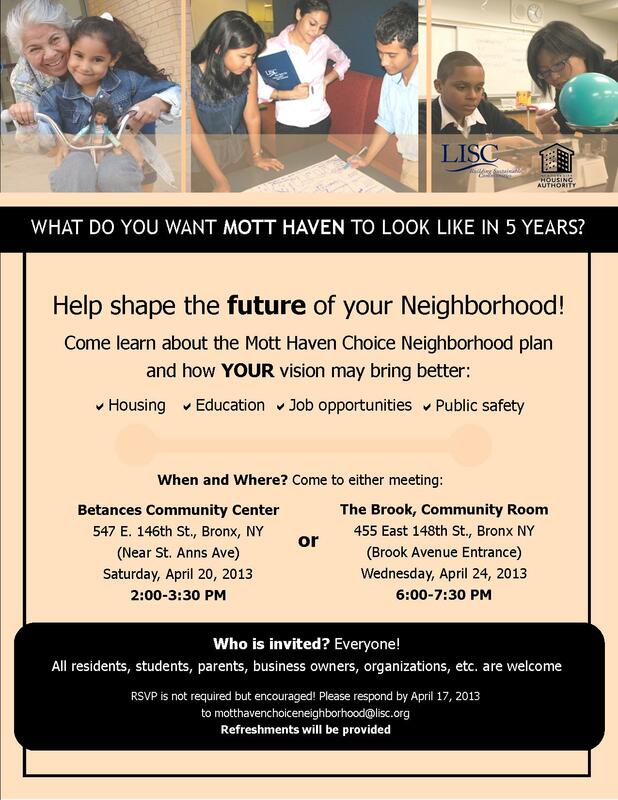 Please reach out to mmvbudget@council.nyc.gov for more information. 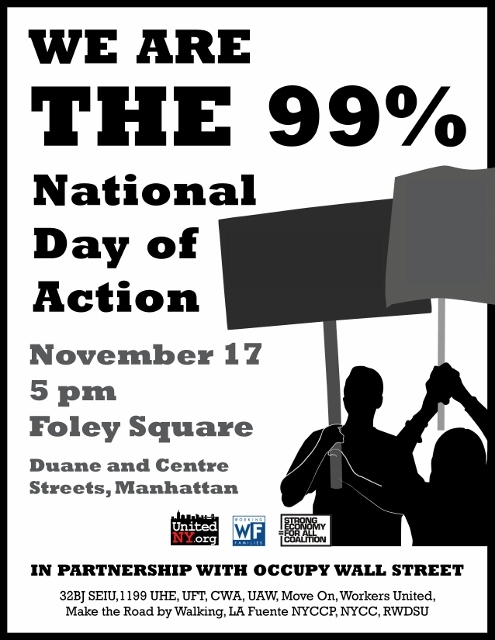 Tomorrow, November 17th, thousands of New Yorkers will take part in a National Day of Action in support of Occupy Wall Street. As you know, the City will begin enforcing new rules at Zuccotti Park, which will prohibit OWS protestors from staying overnight and using tents and tarps. 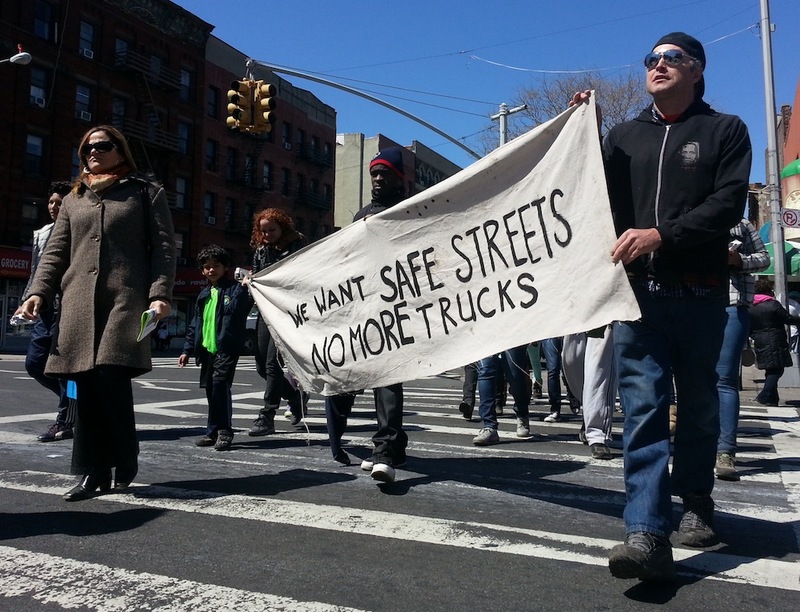 More than ever, this movement needs the support from all of New York City’s 99 percent. A rally will be held tomorrow at 5:00 p.m. in Foley Square to commemorate the two month anniversary of this global movement and to continue the call for economic justice in our city and our nation. We urge everyone to join us at this rally so that we can all make our voices heard! Check out this Facebook event to RSVP and to learn more details on all of the day’s actions. If you are interested in joining our office at the rally tomorrow, please call Lauren in our District Office at 212-828-9800. Yesterday, Melissa joined many of her colleagues and partners in the labor movement in condemning the overnight removal of the OWS protestors from Zuccotti Park. Click here for coverage from NY1. Below is a joint statement issued by several Council Members which also criticized the late night eviction. We, the undersigned members of the New York City Council, are dismayed by the late night eviction of the occupation of Wall Street. We condemn the violation of the FirstAmendment rights of the protesters. It is shameful to use the cover of darkness to trample on civil liberties without fear of media scrutiny or a public response. We are proud to be a part of the movement for economic and social justice and shared sacrifice sparked by Occupy Wall Street. 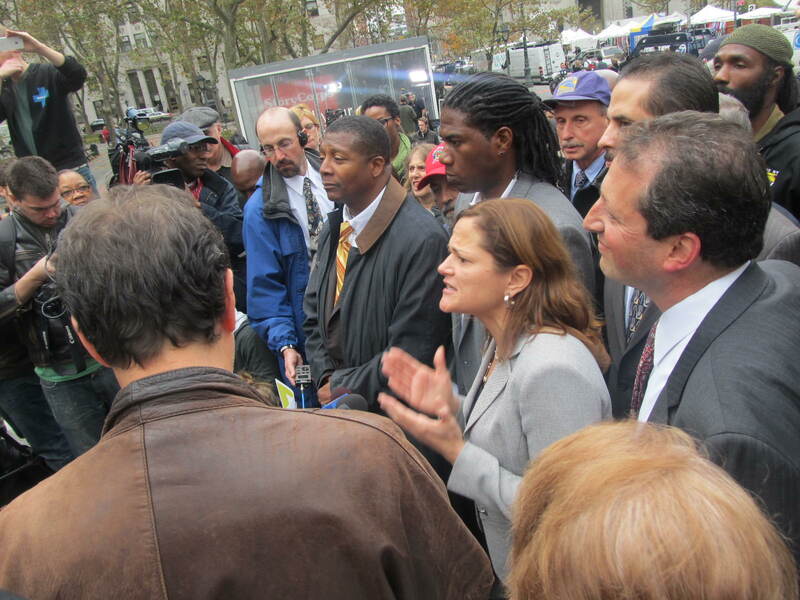 We commend Council Members Ydanis Rodriguez and Jumaane Williams, who demonstrated their solidarity by standing with protesters at Zuccotti Park last night. In the aftermath of the eviction, we reiterate our support and look toward the future. We know that the fight is far from over, and that last night’s events will only fuel the fire for change. We will march to hold the banks accountable and call for a fairer economy on November 17 and beyond. 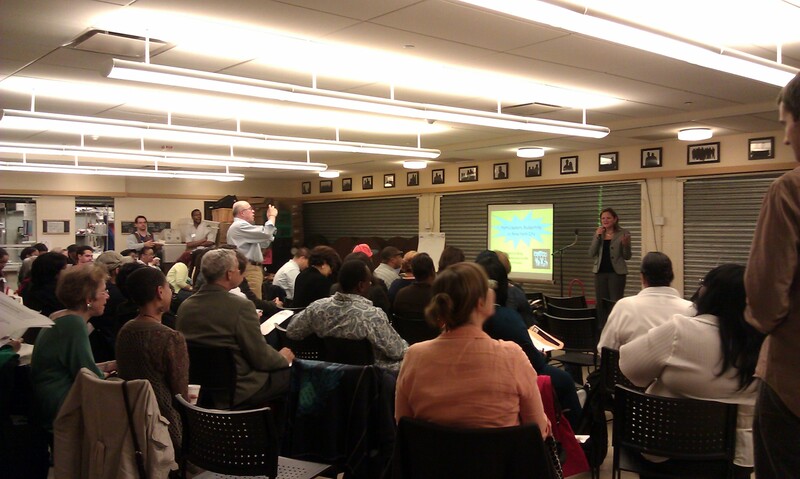 Missed our Participatory Budgeting Neighborhood Assemblies? We are excited to announce that project ideas for the process can now be submitted online! 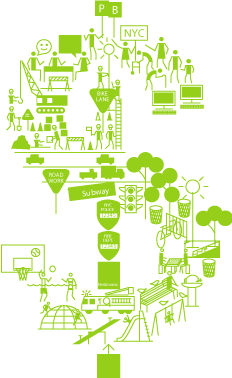 On a webpage created by our partners at the Project for Public Spaces, you can suggest ideas which will appear on a map. You can also view others’ ideas and comment on them. Because we are moving ahead quickly through the process, only those ideas that are submitted this week (before the end of the day on Sunday, November 20th) will be guaranteed to be presented to budget delegate committees. Click here to visit the idea submission webpage. 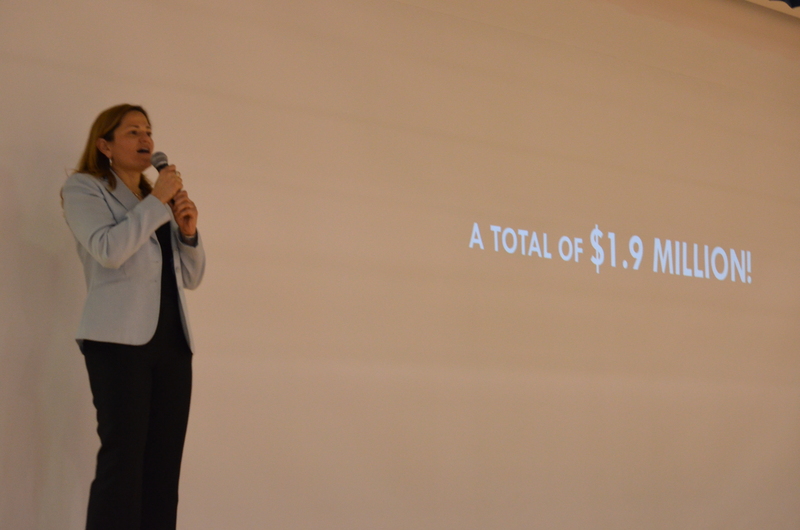 Remember: Council Member Mark-Viverito has pledged $1 million in capital funds for the participatory budgeting process in our community. Project ideas should be for capital (infrastructure) projects in our district, and should serve the needs of members of our community. For some examples of capital projects, click here. We hope you will take advantage of this final opportunity to brainstorm ideas for inclusion in this process. Budget delegates will soon be working hard to formulate these ideas into budget proposals for our community vote in March. 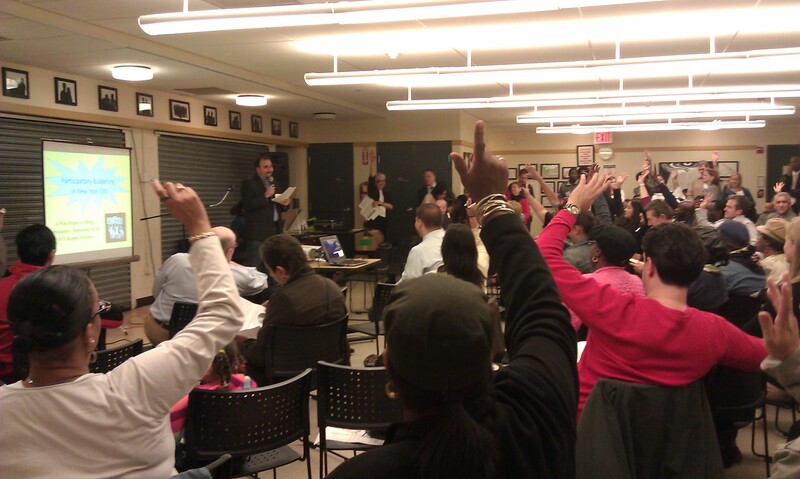 Please stay updated on the participatory budgeting process by visiting www.pbnyc.org. 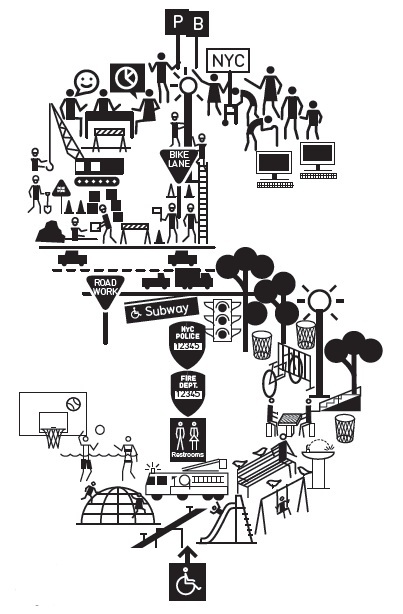 Tell Us What You Want to Build in Your Neighborhood – In a Video! A s part of our new Participatory Budgeting initiative, a contest has been launched where you can create a video to share how you would spend $1 million to improve our community. All of those who create a video will be entered into a raffle to win a Flip video camera! All contest details are below, as well as some tips for those who may be new to making videos. Please read the instructions carefully and upload your submission before the November 21st deadline. 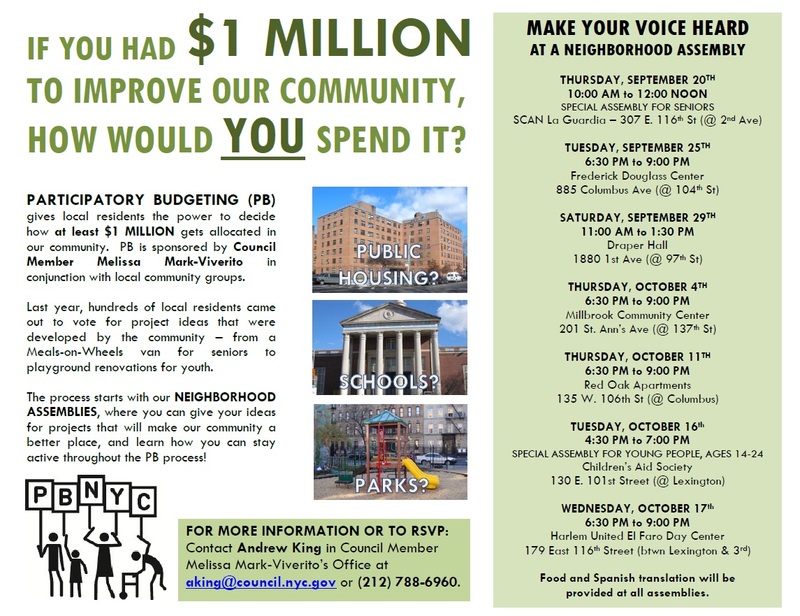 You have a chance to decide how to spend $1 million to improve your neighborhood. What do you want? Tell us in a video. Deadline November 21. Participatory Budgeting is a new and different way to make decisions about publically funded infrastructure projects in your neighborhood. If you or someone you know has ideas about how things could work better in these districts – make a video and let us know! All eligible ideas submitted by November 21 will be considered. Send us an email at pb@artsanddemocracy.org with your contact info and the name of the video that you uploaded and tagged. Everyone who uploads a video will be entered into a raffle for a Flip video camera, so make sure to send us your info! Videos should be no longer than 3 minutes – shorter is great! Capital projects only: that’s money for physical improvements that benefit the public like rebuilding a street, renovating a park, installing benches or street lights, or trash cans, repairing buildings, or buying computers or equipment for a school or community center. Any music used must have the permission of the artist or be available via a Creative Commons license (see https://creativecommons.org/legalmusicforvideos). Or create your own music! 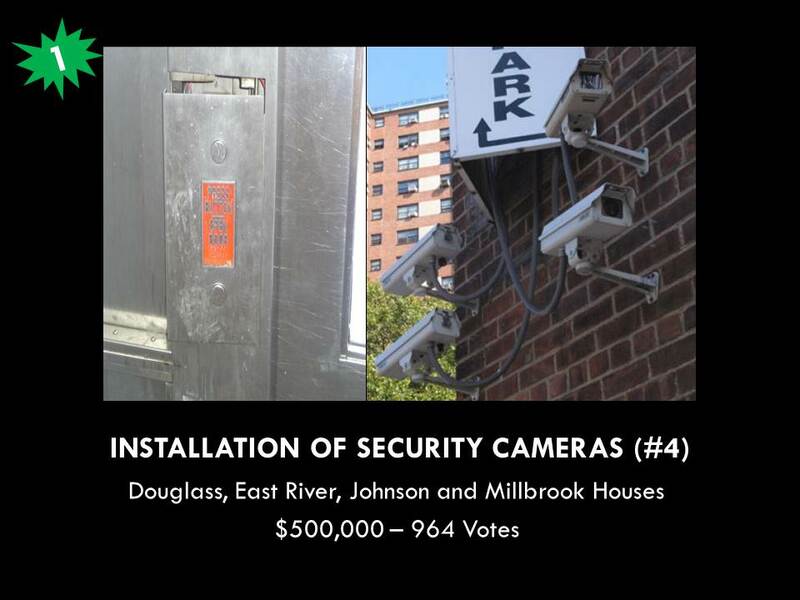 By tagging your video pbnyc you agree to allow the Arts & Democracy Project, Participatory Budgeting Project, and the City Councilmembers to use your video for educational purposes and feature on their websites. Projects need to be within the four City Council districts: District 8, Manhattan/Bronx, Districts 39 and 45 in Brooklyn and District 32 in Queens. 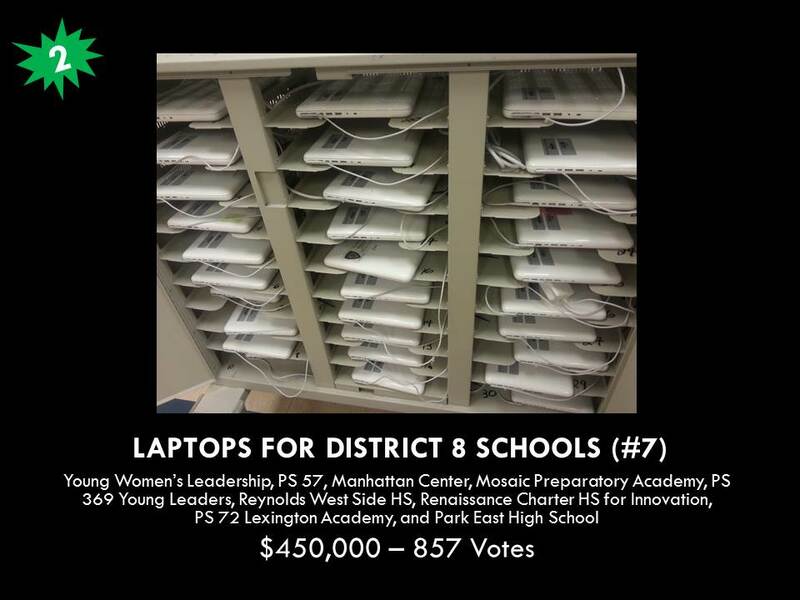 Check http://pbnyc.org to see what neighborhoods are in these districts. Videos need to be submitted by November 30 for your ideas to be considered this year. Plan ahead. Even if your idea is simple, think through how you want to do it before you start recording. If your idea is more complex, write out a script or a storyboard. Make sure you have enough light, especially if you are shooting indoors. If you are recording sound with your camera mic, make sure there are no background noises and then make sure that the person speaking is loud and clear. Make sure you can see everything/everyone in the shot before you start recording. Thanks to the American Friends Service Committee & the National Priorities Project for sharing their resources and inspiring this project! 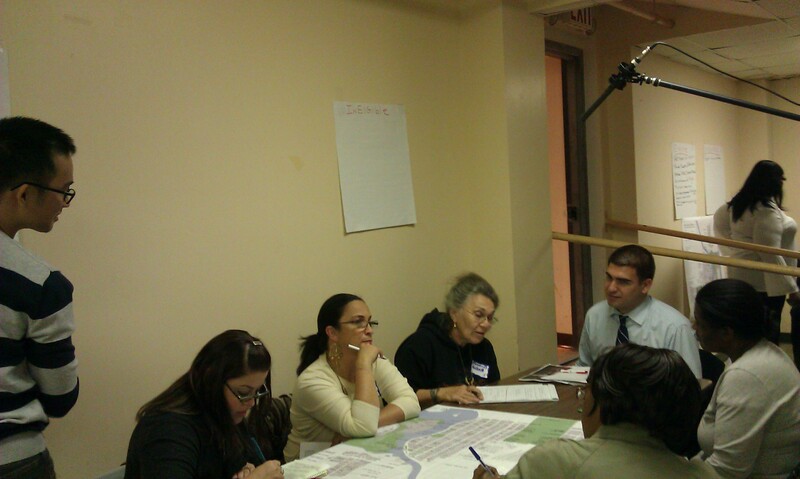 First Neighborhood Assembly Held Last Night, Six More to Go! Over 120 District 8 community members joined us at our first participatory budgeting neighborhood assembly to begin the process of deciding how to allocate $1 million in funding for our district. There are six more of these assemblies to go! The next assembly will be at the Youth Hostel on Amsterdam Ave and 104th Street on Tuesday, October 11th at 6:30 pm. All dates and locations are available here. After time for food and getting to know one another, participants learned more about what the participatory budgeting process entails and what types of projects are eligible. They were then broken up into small groups where the brainstorming process began. Project ideas included increasing lighting on our streets, installing larger and taller trash cans and painting new murals in the community. More than 25 people signed up to be budget delegates, who will help us form the ideas generated throughout the process into concrete proposals that the community will vote on in March 2012. Have a great idea for a project? Want to get involved and serve as a budget delegate? Join as at one of the six remaining assemblies this month. The dates and locations are below. We’re still looking for volunteers to help carry out this process as well (you can sign up to volunteer at http://tinyurl.com/pbvolunteer). A huge thanks to Yorkville Common Pantry for hosting last night’s assembly, and also to Community Board 11, Children’s Aid Society, Community Voices Heard, Violence Intervention Program, the Participatory Budgeting Project and everyone else from the District 8 Committee who was instrumental in making the event a success! And of course thanks to all who participated last night. Please continue to spread the word so we can make sure to pack the house at all of the upcoming neighborhood assemblies. Note: This assembly will be geared toward seniors. Note: This assembly will be geared toward youth. 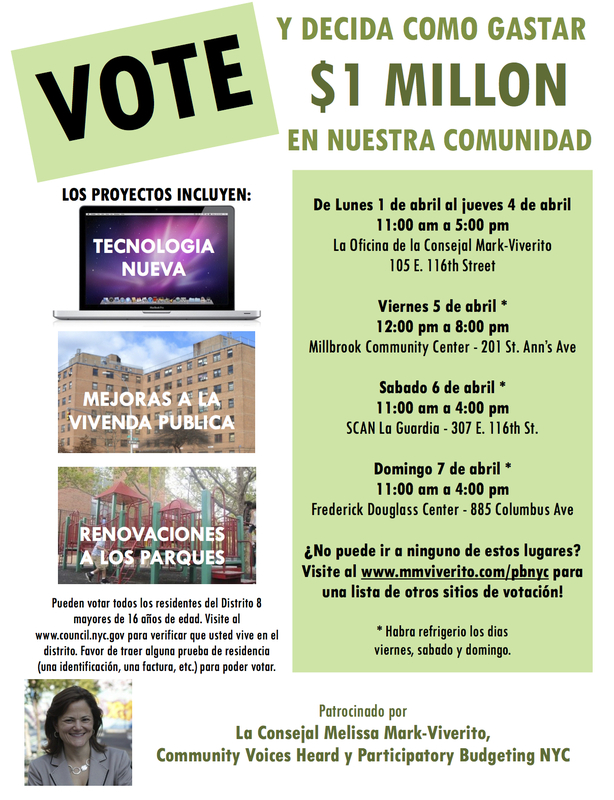 Last week, Melissa’s office announced an exciting new initiative coming to District 8, whereby residents will be able to directly determine how $1 million in capital funds is spent called participatory budgeting. The process officially begins next month when we will hold a series of neighborhood assemblies, brainstorming sessions open to the public during which ideas for community projects will be generated. At these assemblies, local residents will also have the opportunity to sign up as budget delegates, who will help transform the ideas that emerge at the assemblies into concrete proposals for a public vote in March. We hope that you will be able join us at one or more of these events to ensure that your voice is heard! Please help us spread the word to all in our community. 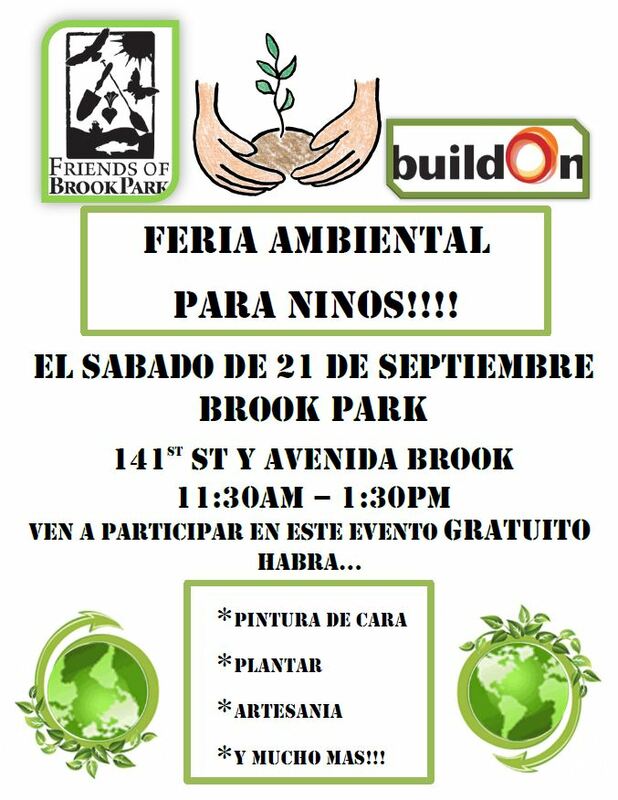 A flyer for the event in English and Spanish is available for viewing and downloading by clicking here. We are also currently looking for volunteers and organizations to help us with this process. Please visit http://tinyurl.com/pbvolunteer for more info. Below are the current dates and locations for the assemblies. Additional background information on the entire participatory budgeting process is available at http://www.mmviverito.com/pbnyc. Food will be provided at all assemblies. Additionally, child care will be provided at evening assemblies. As you may have heard by now, there is a strong possibility that New York City could feel the effects of Hurricane Irene, which is forecasted to move up the East Coast of the U.S. as we head into the weekend. While the extent to which the hurricane will affect the city is still unclear, we are likely to experience a severe storm and possibly up to a Category 1 hurricane on Sunday. As we head into the weekend, it is important for all of us to be well prepared and informed for a worst-case scenario, including possible evacuation of some coastal areas. Parts of El Barrio/East Harlem and Mott Haven are considered low-lying areas. Residents of these neighborhoods should only expect to evacuate in the event of a stronger hurricane (Category 2 or 3), which is not currently in the forecast. However, sometimes weather conditions can be unpredictable. To download a map of evacuation zones and centers in your area, please click here. You can also find out if you live in an evacuation zone by clicking here. Stay up-to-date on weather conditions and other important information at all times by watching the news and checking OEM’s website (http://www.nyc.gov/oem). Stock up on supplies such as water, non-perishable food, flashlights, batteries and a first aid kit. Prepare an emergency supply kit and a “Go Bag.” For more information on what to include, click here. We also encourage you to check on friends, relatives, and neighbors, especially those with disabilities or special needs, and assist them with their preparation and, if necessary, their evacuation. If you need additional information, please visit the OEM website or call 311. We wish you all a safe weekend! Melissa’s office has begun holding special office hours for the growing number of Chinese-speaking constituents in our district each Tuesday from 10:00 a.m. to 1:00 p.m. These office hours will run through the end of August. Below is an introductory letter in both English and Chinese from Preston Tan, our liaison to the Chinese community. Melissa reviews budget documents prior to voting yesterday. 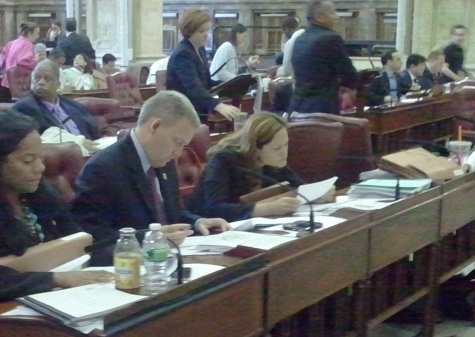 Council Member Melissa Mark-Viverito released a report today on discretionary expense and capital funds that she has helped secure for organizations and schools in our district in the Fiscal Year 2012 budget. The budget was adopted by the City Council yesterday. The report, which can be found below, also provides information on the restorations to the Mayor’s proposed budget made by the City Council, as well as Council initiatives. The adopted FY 2012 budget included critical restorations of cuts proposed by the Mayor to the city’s safety net, in areas ranging from education, parks, libraries and senior centers to HIV/AIDS services, fire engine companies and child protective services workers. Most notably, thanks to the Council’s negotiations with the Mayor and the UFT, the 4,000 plus teachers proposed to be laid off will remain in the classroom. Unfortunately, not all programs could be kept whole in this challenging fiscal environment. Melissa and many of her colleagues continue to push for the need for fair share tax reform and alternative revenue options to avoid further cuts in the future. Please take a moment to review the report, which is embedded below. You can also download it in PDF format by clicking here. 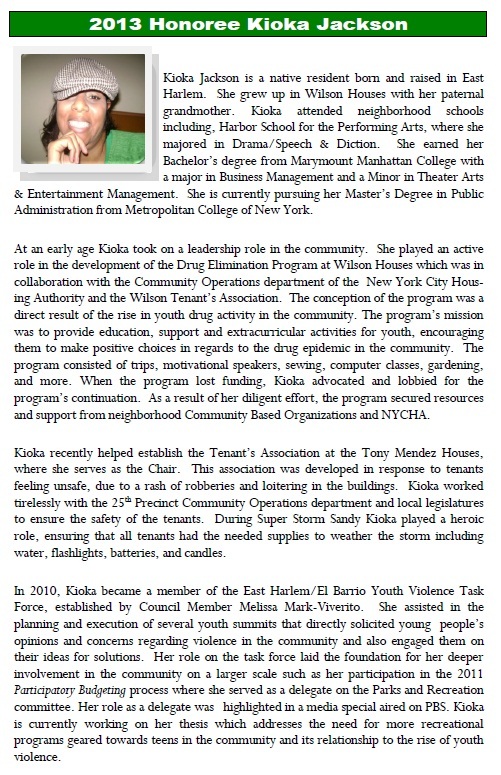 Cross-posted on the NYC Council Parks & Recreation Committee blog. 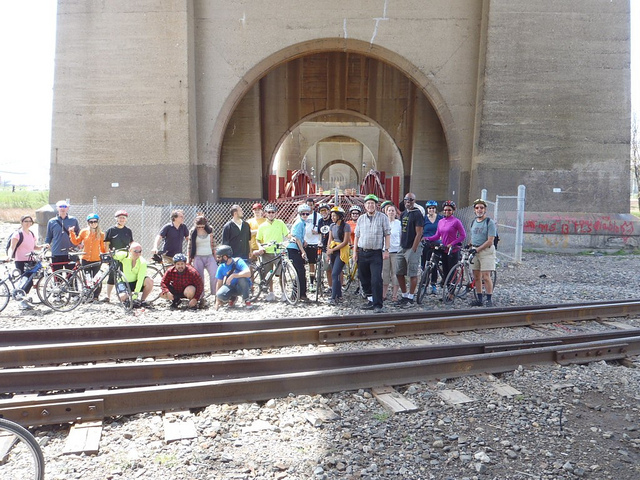 If you build it, they will come – but not to Randalls Island. Dozens of new ballfields in the sprawling park beneath the RFK-Triborough Bridge went unused last summer by the kids who need them most, the city parks boss admits. 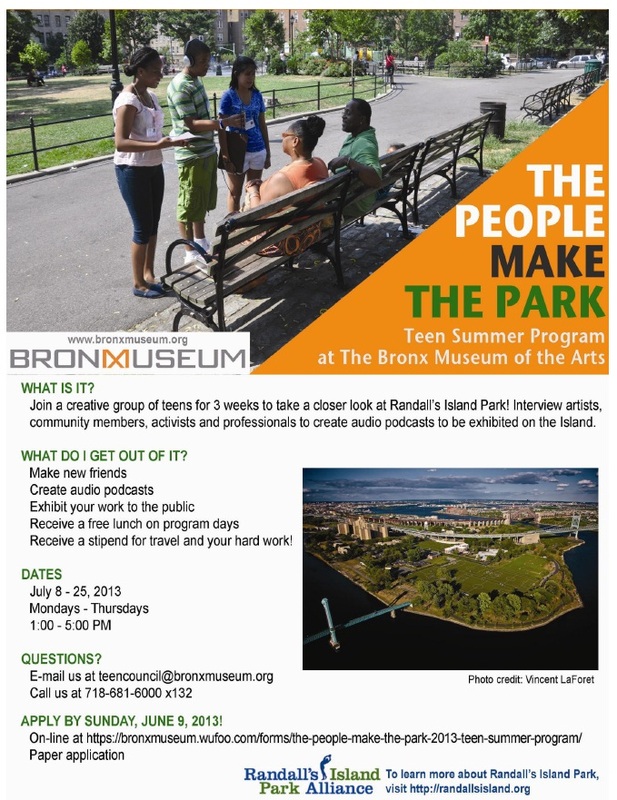 And with school almost out for summer, advocates are complaining the $120 million revamp of Randalls Island Park in early 2010 created a playground for the rich and took crucial dollars from neighborhood ballfields. Parks Commissioner Adrian Benepe cited the low traffic earlier this year to justify plans for a private sports camp. “Fields on Randalls Island have gone largely unused during weekday daytime hours in July and August, and thus availability should not be an issue,” he wrote City Councilwoman Melissa Mark-Viverito in January. The deal called for Florida-based IMG Academies to operate the camp on Randalls Island after donating $200,000 to the Randalls Island Sports Foundation. But plans for the $895-a-week camp fell through in April, with IMG citing low enrollment. Mark-Viverito (D-East Harlem/Bronx) slammed the pricey park rehab, claiming thousands of trees were cut down to make way for the artificial turf fields. 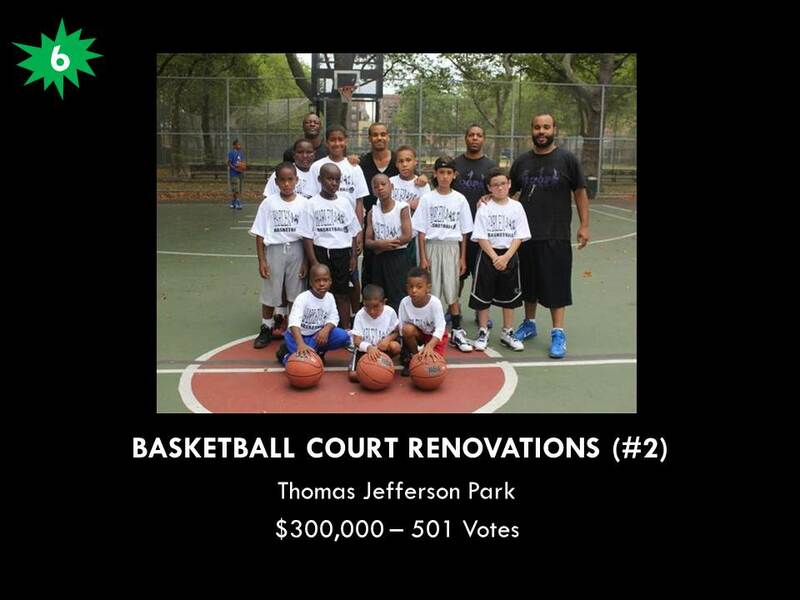 The park boasts fancy golf and tennis centers, but no basketball courts, he added. During the rehab, the city took heat for a $2.2 million-per-year pay-to-play scheme involving Manhattan private schools. 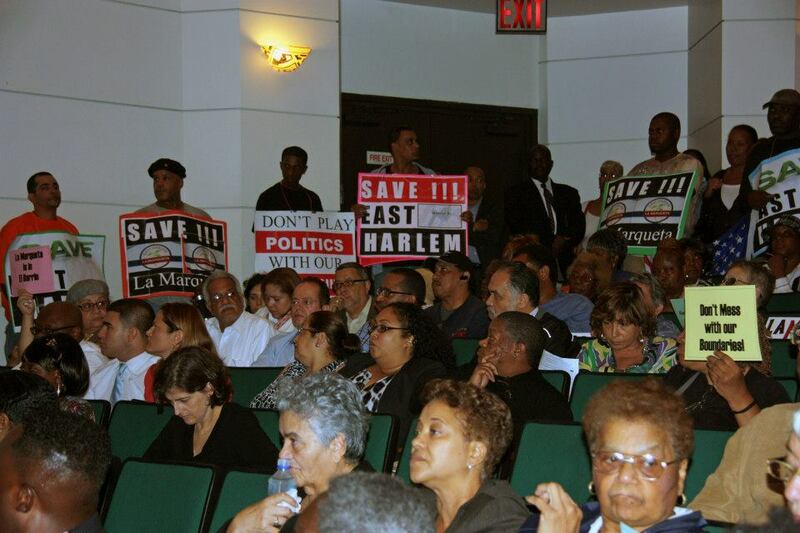 It was struck down in court after East Harlem and Bronx community groups sued. There’s a move afoot now to try and spread the word about what’s in the park. Randalls Island fields go unused partly because they are isolated and more people need to be made aware of the space, said Frances Masrota of Manhattan Community Board 11. 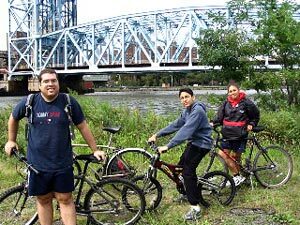 A renovated E. 103rd St. pedestrian bridge is set to reopen soon, while the M35 bus runs between the park and E. 125th St. – but few youngsters make the trip. The Parks Department has assigned a representative to attend Board 11 meetings and share info related to Randalls Island to try to spread the word on what’s there. Check Out Our New Volunteer Opportunities Page! Are you an individual interested in volunteering at an organization in District 8? Do you work at a local organization that is seeking volunteers? If so, please check out our new page dedicated to connecting potential volunteers with organizations in our community: www.mmviverito.com/volunteer. Local organizations are invited to post volunteer opportunities in the comments section of the page, to which interested individuals can respond. Some groups have already begun posting these opportunities. Don’t forget to check back often, as the page will be updated in real time with additional opportunities. We hope that this will be a helpful resource for both potential volunteers and our District 8 organizations. 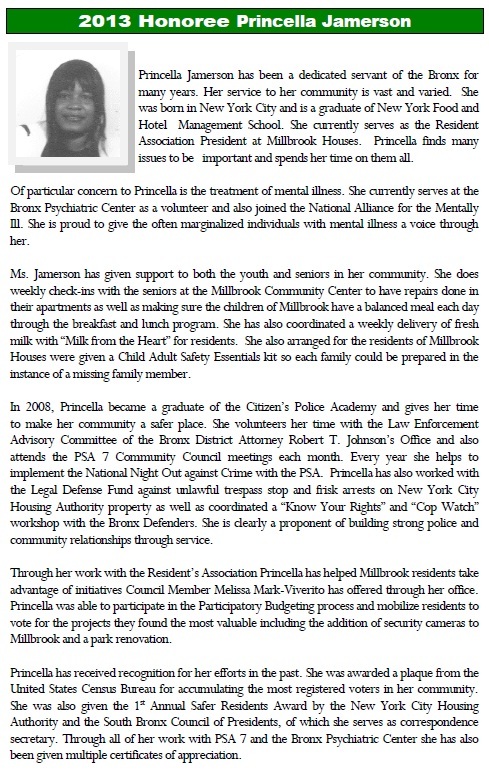 For more information, and to browse the opportunities that have already been posted, please visit www.mmviverito.com/volunteer. 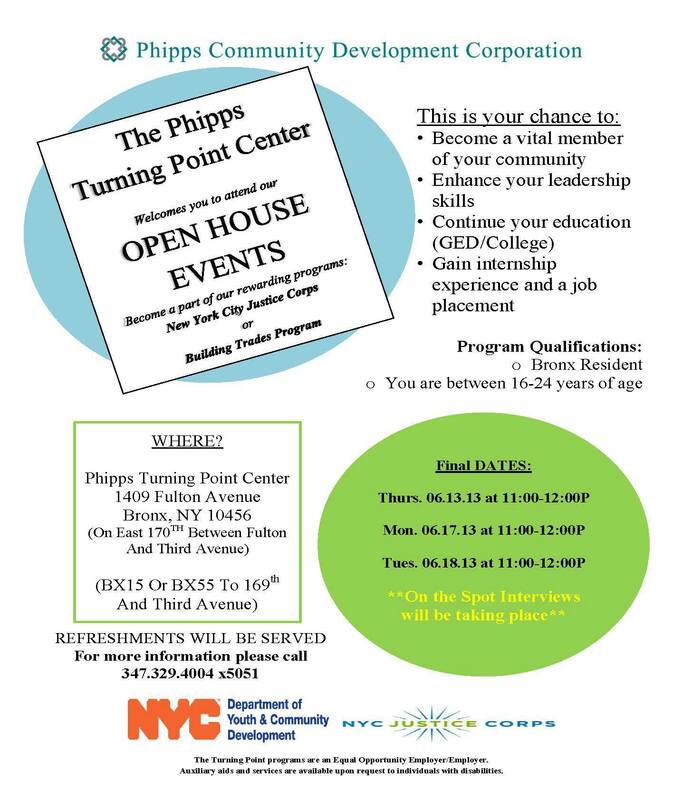 Applications for the Summer Youth Employment Program (SYEP) are now available for New York City residents ages 14 to 24. SYEP is a seven week job program that provides youth with work experience, life skills training and income during the summer months. The application process will run for 4 weeks. The deadline for submission is May 27th, after which a lottery process begins. The program kicks off on Tuesday, July 5, 2011 and continues through Saturday, August 20, 2011. You can also download a paper application in PDF or view FAQs for more information. Melissa recently sat down with Teamsters Local 237 President Gregory Floyd to talk about her time in office so far, her history of labor activism and the recent events in Wisconsin. This forum is an opportunity for tenants to obtain information on issues such as getting repairs, housing court, rent subsidies for seniors, NYCHA housing, Section 8, dealing with bedbugs, tenants’ rights, and much more. The event is being organized by the Department of Housing Preservation and Development (HPD) in partnership with Melissa and is a chance for members of our communities to articulate their issues and concerns regarding housing. See below for flyers in English and Spanish and please spread the word! We hope to see you there. At a City Council hearing this week, Melissa questioned NYPD Commissioner Ray Kelly regarding the huge increase in low-level marijuana arrests in the City, which are estimated to cost over $75 million per year, according to a report by the Drug Policy Alliance. Last year, over 50,000 people (84% of which were Black and Latino) were arrested for possessing small amounts of marijuana, even though it was decriminalized in 1977. In 2010, more people were arrested for marijuana possession than in the entire period spanning 1978 to 1996. 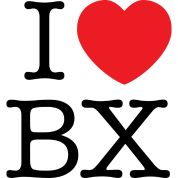 Click image to open video. While possession of small amounts of marijuana was previously decriminalized by the State legislature, those who are arrested are typically caught with marijuana “in public view.” However, there is a great deal of anecdotal evidence that, during stop and frisks, individuals are asked to take out what is in their pockets, thereby exposing what was previously concealed marijuana. Last year, the 25th Precinct, which covers El Barrio/East Harlem currently ranked number 14 out of 75 in the number of marijuana arrests, according to an analysis by the Institute for Juvenile Justice Reform & Alternatives and the Drug Policy Alliance. 94% of those arrested are people of color. The 23rd Precinct on the West Side of our district ranked number 31 and the 40th Precinct, which covers Mott Haven, ranked number 26. The City Council has launched its “Save Our Centers Campaign” in response to the possible closing of up to 105 senior centers citywide, as a result of Governor Cuomo’s New York State budget proposal. The campaign aims to convince the Governor and the State Legislature to make the funding available in the State budget to keep the centers open. Tomorrow, Melissa will join other Council Members in going up to Albany to meet with legislators on this and other budgetary issues of importance to the City of New York. The Governor’s current budget would move over $25 million out of the City’s Department for the Aging (DFTA). Of the current senior centers on the closure list, six are in our district (four in El Barrio/East Harlem and two in the South Bronx). The full list is available for download here. We need your help to send a strong message to Albany that allowing half of our senior centers to close their doors is unacceptable. Click here to download a letter to Governor Cuomo that you can sign. Please ask your family, friends and neighbors to do the same. You can mail or drop signed letters off to our District Office (105 E. 116th Street, NY, NY 10029). Please also share the flyer below (in English and Spanish) with seniors and other community members to spread awareness of these impending cuts. 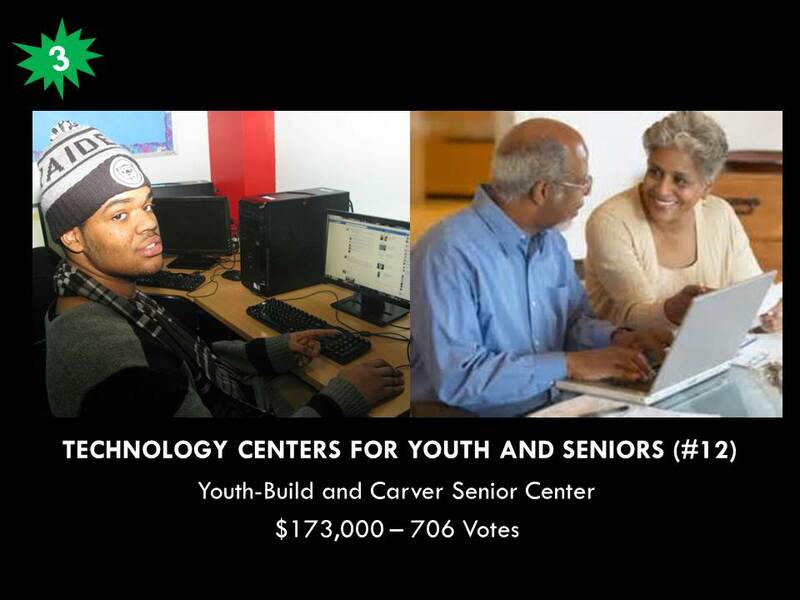 Check back here for more updates on the campaign to save our centers. Melissa has sent a letter to Schools Chancellor Cathie Black regarding the impact of school co-locations in all parts of our district. In El Barrio/East Harlem, these co-location arrangements, whereby new schools (often charters) are placed within existing school buildings, are already common, and we have seen increasing proposals to establish similar arrangements on the West Side and in the South Bronx. How do you feel about co-locations in our communities? The City Council has negotiated a deal with the Bloomberg administration to avoid mid-year budget cuts to core services, from case management for seniors to shelter beds for homeless youth, as well as to defer increases in recreation center fees and parking meter rates. This deal only applies to the current fiscal year, which ends in June. 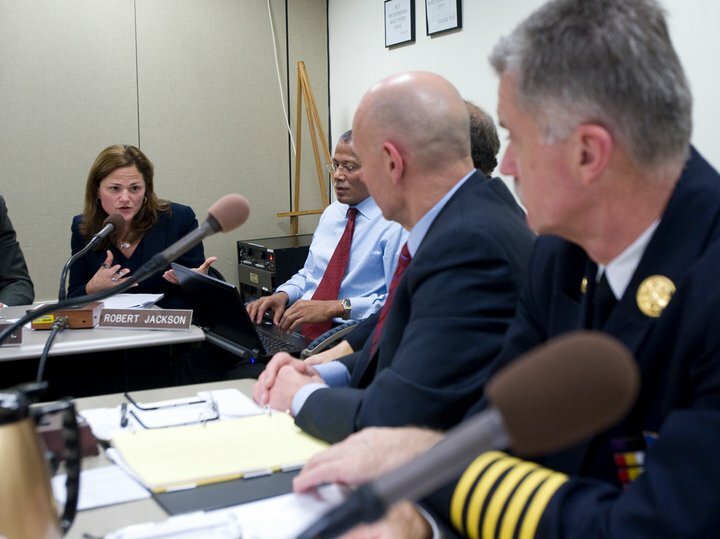 Melissa questions the FDNY Commissioner at a Council budget hearing (Photo by William Alatriste). The City still faces a $2.4 billion deficit for the next Fiscal Year and the Bloomberg administration is already proposing over a billion dollars in cuts for Fiscal Year 2012 (which begins in July). Melissa strongly maintains her position that the only way to fully address these recurring budget deficits is to ask the wealthiest New Yorkers to put in their fair share through progressive taxation. With more trains, more live performances, and more fun than ever before, it’s the perfect time to visit the Holiday Train Show. 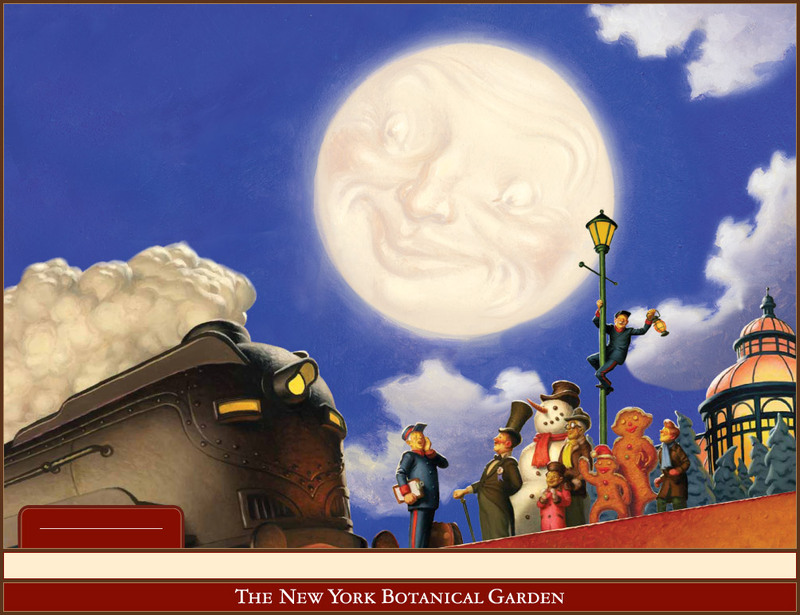 Wrapped in the glow of twinkling lights, model trains wind their way through an enchanting world featuring replicas of more than 140 New York landmarks. Decorate gingersnaps, explore the Garden grounds, pick up holiday gifts in the Shop—it’s a whole day of fun for the entire family. For more information, visit http://www.nybg.org/hts/. We hope our constituents will take advantage of these discounted rates for local residents! 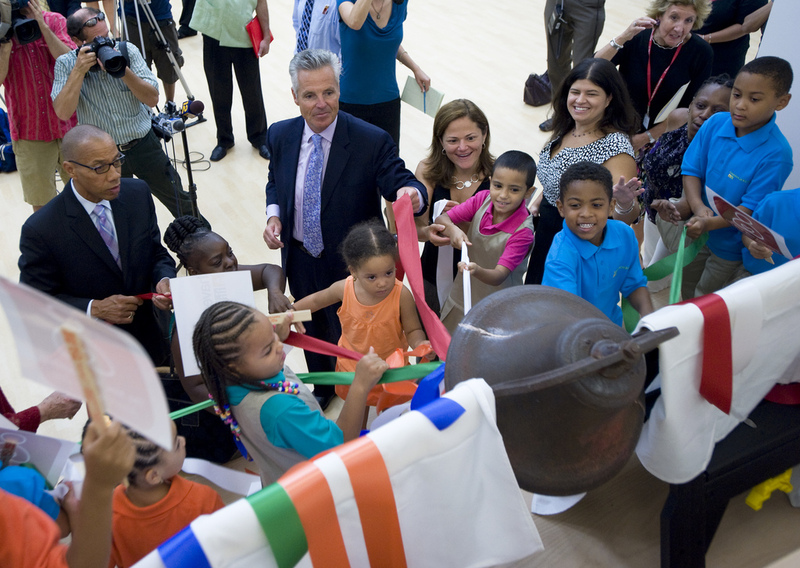 Yesterday, Melissa joined students, parents and faculty in celebrating the opening of a new building which will house the Mott Haven Academy Charter School in the Bronx. Haven Academy partners with New York Foundling to provide additional services focused on children that are in foster care or receiving preventive services. The school is now located at 170 Brown Place, just down the street from their old location, sharing space at P.S. 43. The new building is environmentally-friendly and LEED certified. The school will ultimately grow to serve over 300 students in Grades K-8. Currently, a third of enrollees are in foster care, a third are receiving preventive services and a third are from the general neighborhood population. The new school building provides a full academic program, prevention programs and support services for families, social services counselors, a medical clinic that offers free healthcare for families without insurance, as well as afterschool and arts programs for students. Not far from the new Haven Academy location, the Department of Education also announced yesterday the opening of the Mott Haven Educational Campus, which will house over 2,000 seats for high school students, as well as 25 additional new school locations throughout the city. As you may know, New York City will begin implementing a new voting system this year. With primaries coming up next month, it is important that we are all prepared to vote using this new system. 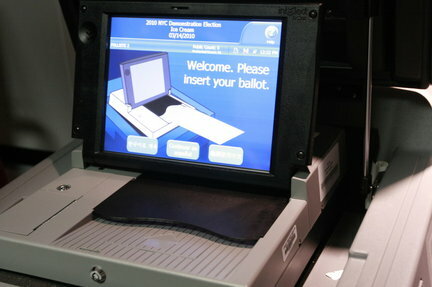 The NYC Board of Elections is currently holding demonstrations of the new voting machine throughout the city. A few of these events will be held right here in our district (see details below). If you cannot attend these demonstrations, be sure to review the instructions available here. Don’t forget to vote on Primary Day, September 14th, 2010! Yesterday, the City Council adopted the budget for Fiscal Year 2011. Our office has prepared a report for our constituents on this year’s budget, particularly regarding the resources Melissa has secured for District 8 and the restorations and initiatives she helped fight for during this process. We hope you will take a moment to read the report. We have also launched a new section of the blog that will house budget-related information. It can be accessed by clicking the ‘Budget’ tab at the top of the page. If you cannot see the report below, click here to download it in PDF format. On Thursday evening, Public Advocate Bill de Blasio and Bronx Borough President Ruben Diaz Jr. will host a town hall meeting on the state of New York City’s young people. The event, entitled “Walking the Walk” will bring together youth, parents, educators and community organizers to share experiences, ask questions and start a conversation about the future for children and teenagers in our city. 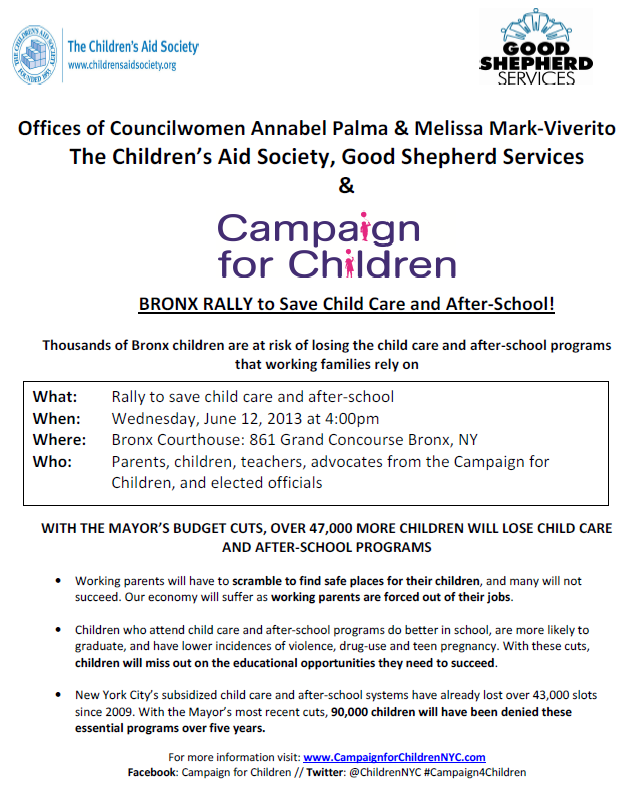 The event is co-sponsored by Melissa and many other elected officials representing the Bronx. The MTA has proposed a number of serious cuts and service reductions on buses, trains and Access-A-Rides throughout the city, as well as the phasing out of free MetroCards for NYC students. These service reductions will lead to an increase in waiting times and crowding on our subway and bus lines, and the cuts to student MetroCards will only further increase the financial hardship already weighing so heavily on our city’s families. Meanwhile, cuts to Access-A-Ride service and eligibility will gravely impact the city’s disabled and senior populations. We must take action against these cuts. Click here to sign the City Council’s online petition, calling on the MTA to look for alternate solutions to resolving their budget deficit, such as using capital and stimulus funding to avoid service and MetroCard cuts. You can also voice your opposition at one of the MTA’s public hearings on this matter, which will be held during the first week of March. See the document below for more information on what you can do to fight these cuts. Click here for a detailed list of service cuts from the MTA. If you are looking for information on the current application process (Fiscal Year 2012), please visit http://www.mmviverito.com/budget. Melissa spoke at the New York City Community Garden Coalition‘s forum on Saturday, where advocates, elected officials and local community members met to discuss how we can protect the city’s community gardens. Click above to see NY1's coverage of the event. The agreement between the City and the State Attorney General’s office that has helped preserve the gardens will soon expire. At the forum, Melissa spoke about the importance of community gardens in her district and throughout the City, as well as the efforts the City C0uncil will engage in to ensure they remain a part of New York City’s neighborhoods. 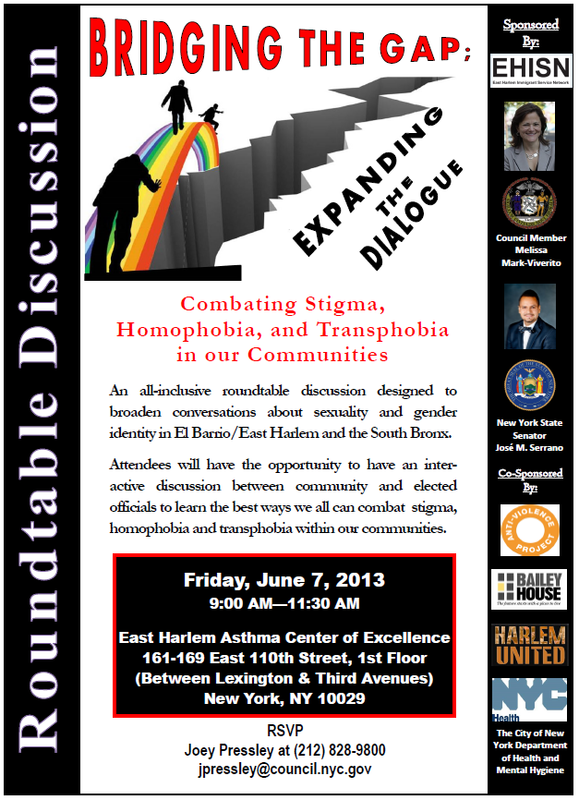 Speaker Christine Quinn and Manhattan Borough President Scott Stringer also took part in this event. Community gardens are more than simply gardens. They are truly unifying public spaces, areas of reprieve and recreation for neighborhoods desperately lacking community space. Local community members have struggled for years to support themselves, oftentimes against powerful forces, and in spite of a lack of support and resources. Today, they know they are no longer alone in this fight and we in the City Council will work until we achieve real permanent protections for our gardens. 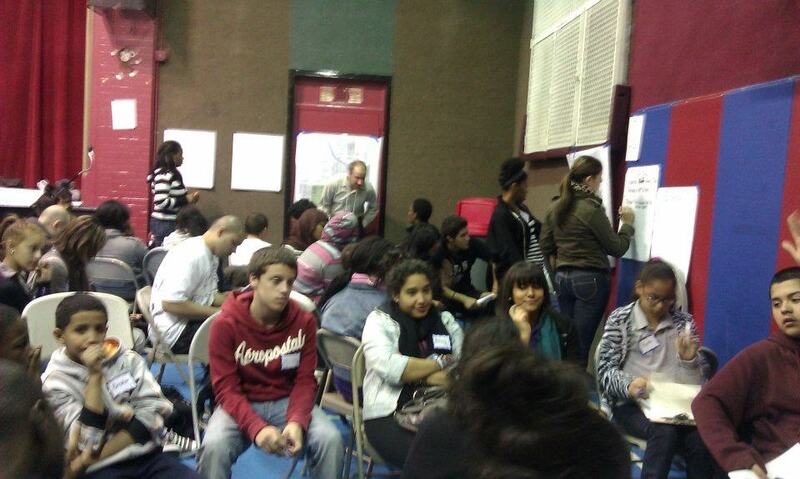 District 8 Youth Council Meeting on 2/23! Attention District 8 Young People! Please join us at our upcoming District 8 Youth Council (D8YC) Meeting on Tuesday, February 23rd from 5:00-6:00 p.m. 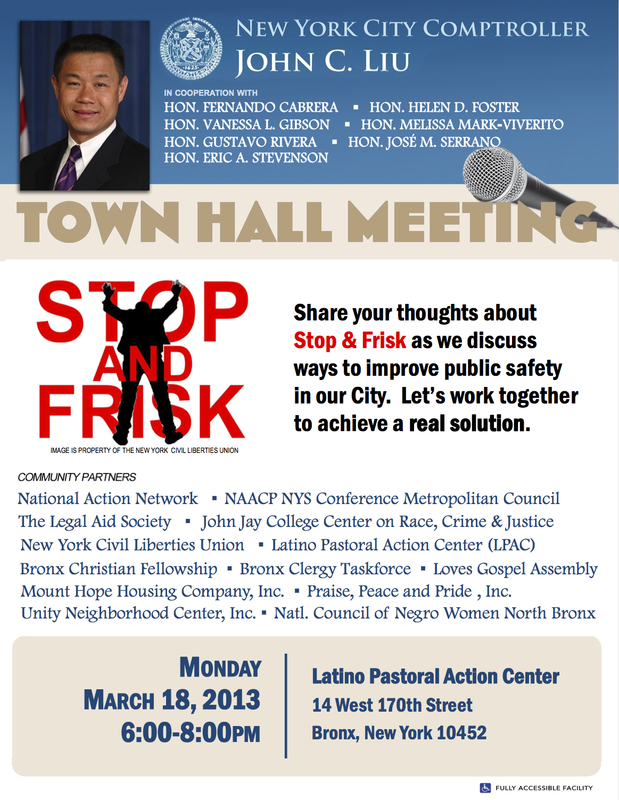 The meeting will be held in our district office, 105 East 116th Street. Step up, speak out and take action on issues impacting our community!